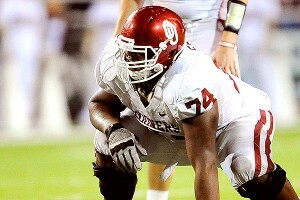 Oklahoma wants to take on a nastier approach in the trenches this year. The Sooners don’t want to break the rules – well, maybe a few little ones when the officials aren’t looking – but desire a ruthlessness from its offensive line. Adam Shead and Nila Kasitati embody that exact character and are in the starting lineup because of it. Earlier this week, Shead and Kasitati were named to the starting lineup at left and right guard, respectively. The competition at the position was as tough as it was deep with at least five guys competing for two spots. “They have the ‘it’ of being an offensive lineman,” center Ty Darlington said. “They’re just good football players,” he said. “They’re not overly strong in the weight room. They’re probably not going to do anything working out numbers-wise that’s going to wow you, but you turn on the film and they can play football. Kasitati has fully returned to form after a 2012 surgery to fix a heart arrhythmia, and Shead is only a few months removed from a back surgery that corrected a long-term issue. Both are 6-foot-4 and are a combined weight of 653 pounds. In fact, Oklahoma’s starters on offensive line average more than 320 pounds, the lightest being the 290-pound Darlington. “We want to be that offensive line where people fear us,” Darlington said. Shead and Kasitati have come to embody that persona. Both are rugged run blockers, who aren’t the strongest players in the weight room but find a way to create gaping holes. They won the battle over other veterans like Tyler Evans and Dionte Savage. Kasitati is even diverse enough to be named Darlington’s back-up at center. Kasitati in particular has benefited greatly from watching himself on film. He can see what he’s doing wrong, instead of watching what other players are doing right and trying to emulate them. He has started seven games in his career – all last season – after missing the 2012 season with an injury and undergoing his corrective heart procedure. Shead suffered a leg injury at the end of the 2013 season and had a corrective procedure on his back earlier this calendar year. He has 28 career starts and will be starting in at least one game for the fourth straight season. Kasitati wouldn’t talk long about playing through the regular season. He didn’t want to jinx it. Shead knew that he would be in a fight for his incumbent job, which he won. The two have been able to battle back from injuries to claim a spot in the starting lineup for the season opener. 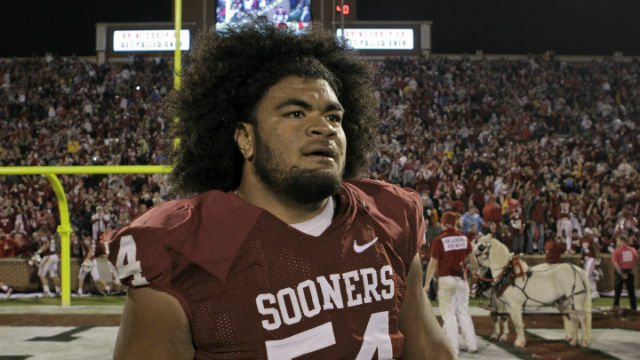 Hopefully for Oklahoma, the pair’s tenacity will disseminate through the rest of the line.